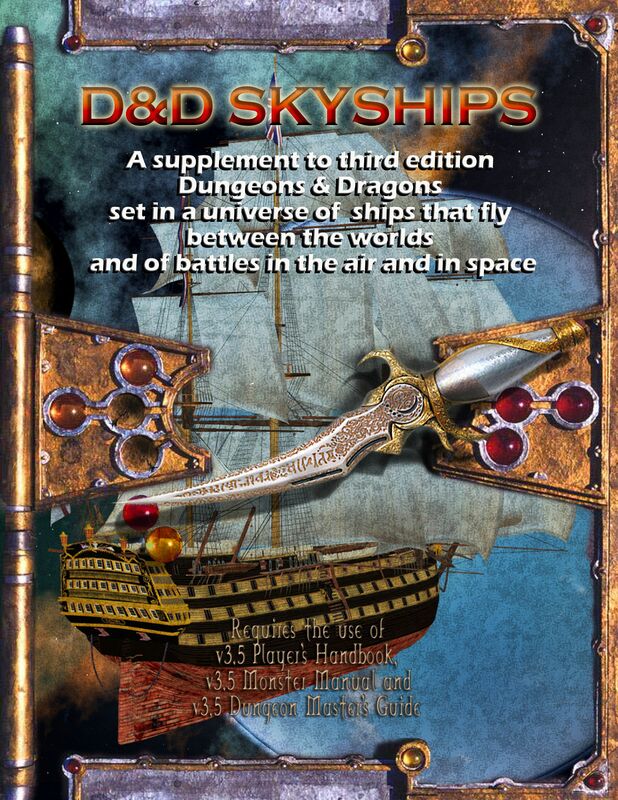 D&D Skyships is a supplement to third edition Dungeons & Dragons set in a universe of ships that fly between the worlds and of battles in the air and in space. What you will not find here is a setting with descriptions of new worlds to explore, monsters to defeat and new races defined. You will not find any new feats and very few new magical spells and magical items. There are also no maps or ship plans. What you will find here is a basic set of rules compatible with Dungeons & Dragons v3.5 that will provide a foundation for taking your D&D adventures into space. These rules are based roughly on Spelljammer. The skyship system uses some of the best features of Spelljammer and discards or replaces others. The original Spelljammer system had “Crystal Spheres” that in turn bobbed about in a substance called Phlogiston, or the Flow. The Crystal Spheres allowed each different AD&D product line to exist in its own sphere, and the Flow allowed for travel between them. The skyship system eliminates all of this and instead uses “planetary systems” and introduces “interstellar teleport” as a way to travel between them. In the original Spelljammer system, every object exerted its own gravity, but only objects of a certain size exerted enough force for a gravity plane to develop. Spherical objects attracted objects towards their surfaces uniformly. Objects with a more irregular shape developed a gravitational plane. This plane worked in both directions so that it was possible, for instance, to walk on the bottom of a ship. The skyship system drops this concept and substitutes a simpler one as explained in the “Gravity” section below. Basically, only very large (planet sized) objects have enough gravity to make any difference and the magical device that controls the ship (the helm) also magically creates gravity on board the ship. The Speljaming idea was that all objects would drag air with them whenever they leave an air envelope. A typical human, for example, would drag enough fresh air with him to breathe for 2-20 turns. After that time ran out the air turned foul for a period of time and then became deadly and unbreathable. Larger objects (such as Spelljammers) would drag larger amounts of air that would stay fresh longer. The skyship system abandons this concept entirely. The magical devices that propel the skyships also create breathable air. A PC that leaves an air envelope doesn’t die instantly (refer to the “Vacuum Exposure” section below) but will not last long unaided. The Spelljammer system used a magical devise called a helm. It was a throne like chair and the mage that controlled it was required to be seated on it to control the ship. When he did so, he lost all of his spells. It effectively removed one PC from all rollplaying activity other than controlling the ship. The skyship system also uses a magical helm. It can be controlled by anyone that can cast magical spells. After the helm is activated the pilot is free to move around the ship. He doesn’t loose his spells and can attempt to cast spells while continuing to control the skyship. The pilot can even leave the ship and travel a short distance away without losing all control. Spelljammer had other types of helms as well. The skyship system has only one type of helm, although it isn’t required to be in the form of a chair. There is no reason other helm types couldn’t be added to your campaign if you choose to do so. Simply use the modifications made here as a guide. Sailing ships are fitted with magical devices that give them the ability to fly through space. These ships are often called skyships. Some races on some worlds have been building skyships for a very long time. Many create them specifically as flying vessels. Some of these are designed to land on land rather than water. Some are designed to never land at all. With few exceptions, vehicles capable of interplanetary travel are powered by a powerful magical device known as a magical helm. This magical item can be any shape or size. It is sometimes incorporated into the ship’s wheel. The only requirement is that it must be bolted securely to the ship’s deck. It is most usually created in the form of a large throne like chair. The helm not only allows the magic user that activated it to control the vessel’s direction and velocity, but also provides an envelope of breathable air at a comfortable temperature and creates an artificial gravity that allows everyone on board to move about on the ship as they would if it were on the water. A helm maintains breathable air at a comfortable temperature that extends 300 feet in all directions centered on the helm itself. This air provides forward pressure on the sails as if the ship were sailing in a moderate wind. This allows a crew of experienced sailors to maneuver the ship as needed. Without sailors manning the sails the ship can only move forward or turn in a very wide arc. Beyond the bubble of air created by the helm lies the vacuum of space. Most planets have breathable air surrounding them out to 32,000 feet (about 6 miles). A helm creates a magical gravity similar to normal gravity on the Earth. This magical effect extends to the edge of the air bubble (300 feet). This magical gravity pulls down in relation to the orientation of the ship. Anyone falling overboard will fall as they would on the Earth until they reach the edge of the air bubble. Ten feet beyond the edge of the magical bubble they will stop falling and simply hover there weightless in the vacuum of space (refer to vacuum exposure below). This will be true for anything dropped. If the ship is moving, anything that falls overboard will simply be left behind once it has left the ships gravity bubble. Anything thrown or fired from the ship will behave normally, as it would on the Earth, until it reaches the edge of the magic bubble. It will then continue in a straight line at its current speed forever, unless it hits something or enters another source of gravity. If two or more ships get close enough to each other that their gravity bubbles touch, they will automatically orient themselves so that “down” on all ships is in the same direction. If a ship enters the gravity of a planet, it will orient itself with that planet’s natural gravity. This alignment of gravity fields occurs almost instantly with no adverse effects to anyone aboard the ship. All planets, even small ones or large asteroids, have natural gravity. The effects of a planet’s gravity extend 32,000 feet above its surface. All planets have gravity roughly equivalent to that experienced on the Earth regardless of the size or mass of the planet. Not all planets are ball shaped. Some may be disk shaped. Others may be in the shape of a cube. Regardless of the shape of the planet, natural gravity (in this fictional universe) always pulls down toward each of the primary surfaces. This will be toward the center of spherical planets, or towards each of the major flat surfaces of a planet with flat sides. It requires someone with magical abilities to control a helm. A player character must be proficient with magic and capable of casting magical spells. The person that controls the helm is called the pilot. The more powerful the pilot, the faster he can fly the skyship. Player characters are considered to have a pilot level equal to the highest level spell they can cast. For instance, a 5th level Wizard or 5th level Cleric or an 11th level Paladin can each cast 3rd level spells, so they would each be a 3rd level pilot. It requires a minimum of a level 1 pilot (as defined above) to activate a helm. The helm must be securely bolted to a skyship that is in reasonably good shape. If the helm is currently inactive it takes one hour to activate it. This is called powering up. During this time the pilot must remain in physical contact with the helm and maintain full concentration. The air and gravity bubble expands slowly out from the helm at a rate of 5 feet per minute until it reaches a radius of 300 feet. At this time it becomes fully activated. The pilot can not use the helm to move the ship until it is fully activated. Once activated, as long as the pilot is on the skyship he can control the ship with no need to keep in physical contact with the helm. A pilot may disengage from the helm at will at any time. A helm doesn’t loose all of its power the moment it is disengaged. As soon as it is disengaged it stops moving and floats in place. It then takes an hour before it becomes fully inactive. During this time, the air and gravitational bubble grows smaller at a rate of 5 feet per minute until, after one hour, it completely collapses and the helm again becomes inactive. Any pilot can re-activate a helm while it is in the process of powering down. The new pilot must remain in contact with the helm and maintain concentration while it powers up. It must power up for the same amount of time as it has been powering down. A helm deactivates and begins powering down if the pilot is reduced to 0 or fewer hit points. If the pilot becomes unconscious or for some other reason is unable to provide the minimum concentration required to control the ship, it will continue at its current speed and direction. Another qualified pilot can take over control of the ship by simply placing his hand on the helm while the existing pilot disengages. Pilots can not be removed from control of their ship against their will as long as they are in physical contact with the helm. If the existing pilot is not in contact with the helm and refuses or is unable to disengage, the prospective new pilot can gain control of the helm by maintaining contact with the helm and wining an opposed Willpower check against the current pilot. The pilot is the individual steering the vessel and controls the general direction and speed of the skyship. He directs the ship’s general motion (fine maneuvering is provided by sails, rigging, and crew). The pilot in a sense merges with the ship, he feels as if he is personally flying through space, and can perceive the world around the ship as if he were flying just above the ships highest mast. The pilot perceives damage to the ship as white flashes of pain, but takes no actual, personal damage in most cases. Sometimes, however, the pain is intense enough to cause unconsciousness; this is called “pilot shock” and is usually a result of a critical hit. In many ways, piloting a vessel is instinctual, because the pilot feels he “merges” with the vessel he can generally control the vessel as easily as walking. The ship handling crew control all of the finer aspects of maneuver. While flying the pilot retains his normal senses and can hold a conversation with those nearby. In general, piloting is no more difficult then walking so that anything a person can reasonably be expected to concentrate on while walking can be done while flying. This includes casting spells. Because it does require a bit of concentration to maintain control of the skyship, any spell he attempts requires a (DC 10) concentration check. A skyship always flies smoothly, so other spell casters do not require a concentration check due to the ship’s motion. If a pilot leaves a skyhip that he is controlling it will stop moving and float in space at that location. He will not be able to make the ship move while he is off of it. He will regain full control once he returns. If the pilot travels more than six miles away from the ship the helm will disengage as described above. Voyages often require several days or months of continuous travel aboard the skyship. The pilot requires 8 hours of rest or sleep each day. During this time and during the time he spends preparing his spells, praying, studying his spell books, meditating, etc. he can not control the ship. During those times the ship will continue at the same speed and direction he last set. Beings exposed to the airless cold of space are not immediately doomed. Contrary to popular belief, characters exposed to vacuum do not immediately freeze or explode, and their blood does not boil in their veins. While space is very cold, heat does not transfer away from a body that quickly. A character exposed to the vacuum of space can hold his breath for 2 rounds per point of Constitution. After this period of time, you must make a DC 10 Constitution check in order to continue holding your breath. The save must be repeated each round, with the DC increasing by +1 for each previous success. When you fail one of these Constitution checks, you begin to suffocate. In the first round, you fall unconscious (0 hit points). In the following round, you drop to -1 hit points and are dying. In the third round, your character suffocates. In addition to the lack of air, you must also deal with the extreme cold which deals 1d6 points of lethal damage per minute (10 rounds), no save. At the end of each minute you must also make a Fortitude save (DC 15, +1 per previous check) or take 1d4 points of nonlethal damage. Those wearing metal armor or coming into contact with very cold metal are affected as if by a chill metal spell. Characters (in this fictional universe) are not affected by radiation in any way. Whether this is because there is no radiation, or living beings are immune to it is left to your imagination. Almost everyone on all planets can speak common. Also Elves speak Elvin, Dwarves speak Dwarven, etc. Sages have many theories to explain this, but the truth is that no one really knows why creatures on different planets would evolve to speak the same languages. Those who travel between the planets are just happy that they do. I would really appreciate any comments, especially if you use them in play (they have not yet been play-tested).